Easy to use and no mess - the simple way to perk up your olives! 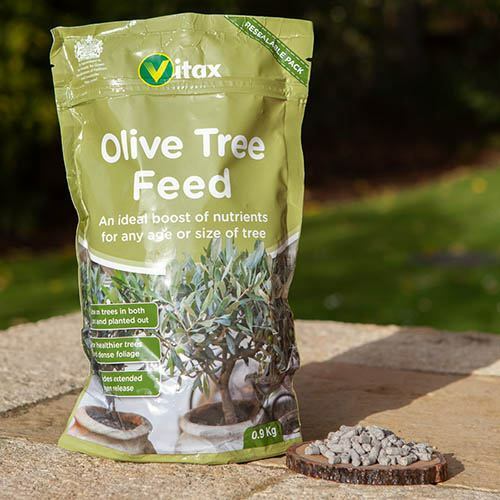 Provide a perfect boost for your olive trees with Vitax olive tree feed. An organic-based fertiliser with added magnesium and trace elements for olive trees grown in pots or in the garden, it’s the convenient and mess-free way to quickly provide your plant with a health boost. With a specially created formula, this specialist feed provides an extended release of organic nutrients for healthier plants and luxurious, dense foliage. Use on any size tree from young to old, it’s a great way to boost fruiting too. Apply evenly to the soil, preferable when it is moist. Lightly incorporate into the top surface of the soil. If conditions are dry, then water the pellets in. Sprinkle pellets evenly beneath the spread of the plant at a rate of 105g per square metre - 3 handfuls. In early spring, sprinkle a handful of pellets evenly around the base of the plant and lightly incorporate into the soil and water in well. Apply a further handful in June.